A student focus group recently held by Parking and Transportation Services (PTS) aimed to discuss and propose solutions to ongoing issues with Tech’s public transportation. The meeting was attended by a number of students and PTS personnel, including Associate Director of Transportation David Williamson and Paul Benigno of Groome Transportation, Tech’s current contractor for public transport services. Students in attendance identified a number of problems, including ongoing inconsistencies in wait times for buses. 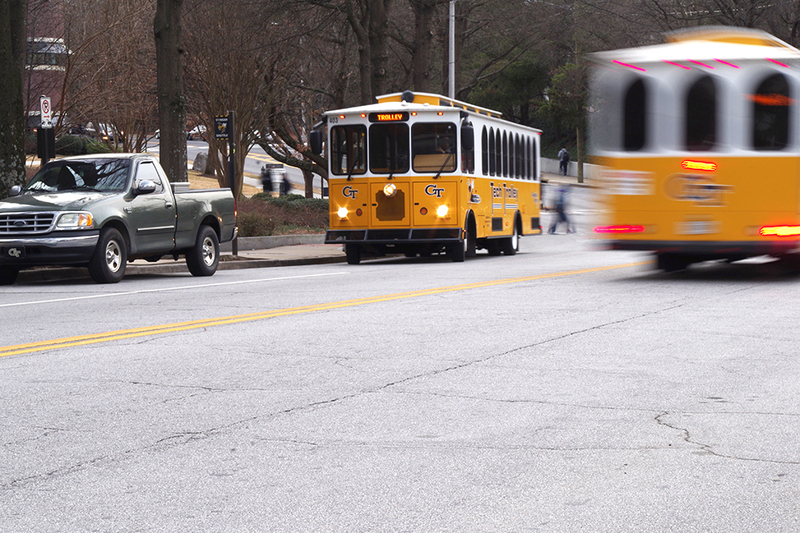 Students cited instances in which drivers skipped certain stops, particularly the one at Techwood and 4th Street, and waited too long at other stops, particularly near the Graduate Living Center, as potential causes. Williamson noted that Trolley drivers are supposed to stop briefly at each stop and abide by their on-board tablets, but the tablets have experienced technical difficulties over the past summer. PTS is considering implementing similar policies on the Stingers, in addition to possibly providing visible timers for driver breaks to enhance transparency between students and drivers. Of additional concern was the accuracy of the “Nextbus” application and time indicators at the stops themselves. According to Benigno, the Nextbus system utilizes historical travel times between stops to provide estimated arrival times and is supposed to display “delayed” notifications at stops if a bus is sitting in traffic. Students also mentioned ongoing controversy over shifting the grocery shuttle to 5 p.m. and later. Williamson cited a survey conducted by PTS last year, which indicated that the majority of students tended to visit Publix after 5 p.m. on weekdays. However, a student did point out that the survey was conducted prior to the opening of the new University House and Square on 5th apartments nearby. Benigno offered additional insight into the future of Tech’s vehicles themselves. He added that switching to vehicles with cutaway van chassis, which are similar to traditional school and shuttle buses, would add ten more seats per bus, but also would remove one set of doors. Regarding efficiency, Benigno stated that Tech Trolleys remain the most expensive form of transport on campus to upkeep, costing over $40,000 more than Stingers to build and far more than a Stinger to maintain and operate.